Wendy Martinez was fatally stabbed near Logan Circle on Tuesday, Sept. 19, 2018. She had been jogging along 11th Street NW, police said. The suspect in the death of a woman who was stabbed while jogging in the Logan Circle neighborhood of Washington, D.C., is not competent to stand trial, a mental health screening determined. The Department of Behavioral Health recommended a full competency evaluation for Anthony Crawford. A judge ordered he remain in jail pending the evaluation. The victim, Wendy Martinez, was jogging in the 1400 block of 11th Street NW on Sept. 18, 2018, when she was fatally stabbed, police have said. 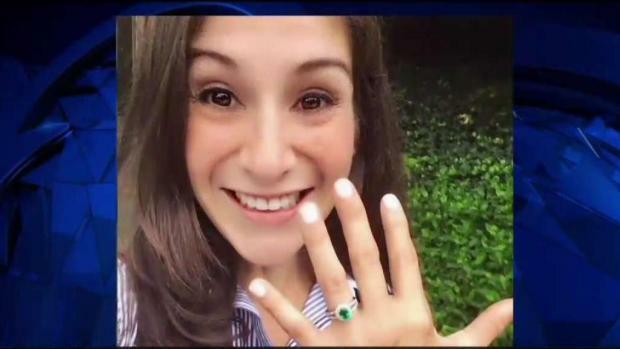 Martinez, 35, was an avid runner and Georgetown University graduate who lived in an upscale apartment just three blocks from where she was killed. She had gotten engaged just a week before her death and had bought a wedding dress with her mother. More evidence was presented in court in the stabbing death of Wendy Martinez. The suspect was seen on video mutiple times near the location of the stabbing and his DNA was found on the knife used the kill Martinez, according to police. On the night Martinez was slain, surveillance video captured Crawford inside a nearby Giant Food store just 20 minutes before the stabbing, a detective said in court. Crawford was in the aisle where the exact same knife as the one found at the murder scene is sold, police said. Martinez was jogging west on P Street NW and was attacked after arriving at the intersection with 11th Street just before 8 p.m.
More video from the street outside a nearby carryout restaurant showed Crawford stabbing Martinez in the back as she tried to run away, police said. Police said they found the knife and the suspect's orange sweater just a few feet from where Martinez was stabbed. The knife had both Martinez's and Crawford's DNA on it, prosecutors said. "It looks like it was an unprovoked attack," Police Chief Peter Newsham has said. Martinez's family released a statement Wednesday saying they were disappointed with the judge's ruling. "While we respect his decision, it deepens our sense of loss. For the rest of our lives, we will wake up every morning and realize, again, that Wendy is no longer with us," the family's statement read. "We don't want Wendy's murder to pass as just another unfortunate event. We want to work with the city – to challenge the leaders of Washington D.C. - to do better. We owe the young people who, like our Wendy, move to Washington D.C. to make a difference – a greater and safer city. Not a city where this type of tragedy can happen and the victim's family is left paying the highest price." The statement continued, "We will continue praying for healing, strength, and peace for everyone who knew and loved Wendy and have suffered great loss."